Microsoft leaves the Rooms. How will Windows Phone OS users make to do lists? Microsoft is axing a much-loved feature of its Windows Phone OS, Rooms, at short notice. An email sent to users yesterday announced that support is ending next month – long before functionally equivalent replacements are in place. 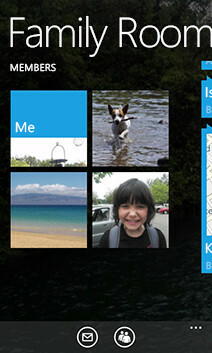 Rooms was introduced with Windows Phone 8 in 2012, and allowed users to chat, share calendars, photos and to do lists. A "Family Room" is already created on the phone by default. The Tile-based UI of Windows Phone conveniently alerts users to updates, such as new appointments, shopping list items and images. From next month, Microsoft says, users will not be able to create new Rooms, or add members to or delete them from existing Rooms. The feature will disappear entirely in Windows 10. Users will be able to continue to work with the data in their Rooms - but only via three discrete websites: One Note, Calendar and One Drive. A user suggestion to save Rooms has already attracted some votes. Users voice concerns that Windows Phone is becoming less distinctive. "Stop trying to be just like the competition - keep being BETTER", writes one. Microsoft is expected to enhance its Skype client to include the Rooms functionality – but only Microsoft knows when. We requested a comment from Microsoft, but had not heard back at press time. With Windows 8.1 last year, Microsoft began to remove the tight integration that strongly differentiated Windows Phone from Android and iOS. For example, the phone nicely aggregated social media activity in the system, within Hubs and on contact cards. Now, it throws the user into a dedicated Twitter or Facebook app – a much clunkier experience.